Like your lungs, we work together for you. Whether you’re in the Rocky Mountain region or somewhere else nationally, UCHealth University of Colorado Hospital offers a team of experts ready to give you the internationally recognized care you deserve. Our Comprehensive Lung and Breathing Program is based in metro Denver and uses a unique multidisciplinary approach to give you access to all the specialists you need in one location. Call us at 720.848.4400 to learn more. 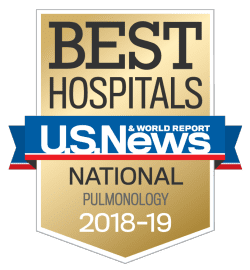 UCHealth’s Comprehensive Lung and Breathing Program in metro Denver is ranked #1 in the country by U.S. News and World Report. From a chronic cough to the most complex lung diseases, we treat a wide range of respiratory conditions at our multiple metro Denver locations. Allergy and asthma. From the simplest to most complicated allergy and asthma cases, we’re here to solve your unique problem. We can help you get to the bottom of food allergies, drug allergies and environmental factors contributing to skin issues, breathing difficulty and more. Cancer. UCHealth University of Colorado Cancer Center in metro Denver is the place to go for your head and neck or lung cancer. Our world-renowned team of specialists have set new standards in the treatment of many of these cancers, making us one of the few NCI-designated Comprehensive Cancer Centers in the country. Interventional pulmonology. Interventional pulmonology involves minimally invasive procedures used to diagnose and treat lung problems. Our dedicated team uses this state-of-the-art technology to diagnose and treat respiratory conditions in a way that decreases discomfort, complications and overall recovery time in one of the top facilities in the country. Nasal and sinus disorders. UCHealth is where you’ll find the only group of specialty-trained rhinologists in the state. These experts are involved in the latest and greatest research so they can always bring you the best routine and advanced care for your sinus or nasal problem. Pulmonary disease. Since everyone’s situation is different, we don’t offer a generalized approach to treating you. Our experts specialize in the diagnosis and treatment of lung conditions such as autoimmune lung disease, chronic cough, COPD, emphysema, interstitial lung disease and shortness of breath, while consulting with one other on the best way to move forward with your condition. Pulmonary vascular disease. If you have pulmonary vascular disease, you have come to the right place. Our clinic offers top-level care when it comes to pulmonary hypertension, pulmonary embolism, hereditary hemorrhagic telangiectasia and respiratory disorders related to high altitude. Sleep medicine. To us, sleep is a science. We offer the technology proven to give you a good night’s rest. In addition to treatments for sleep apnea, insomnia, narcolepsy and other conditions, we were the first place in Metro Denver to offer Inspire therapy and other advanced surgeries for obstructive sleep apnea (OSA). Thoracic surgery. While there are many surgeons out there, few focus specifically on thoracic surgery like we do at UCHealth. From your lungs to your chest wall to your upper airway, should you need an expert in those areas, you can find them here. Transplant. Lung transplants may not seem like that rare of a thing, but they’re definitely rare in Colorado. In fact, UCHealth is home to the only lung transplant program in the state. Voice, airway and swallowing disorders. These types of problems can’t be treated just anywhere. Our Ear, Nose and Throat Clinic is the only place in town with some of the advanced therapies and surgeries you need to treat vocal cord dysfunction, laryngeal tumors and more.